What is the ACT Honour Walk? 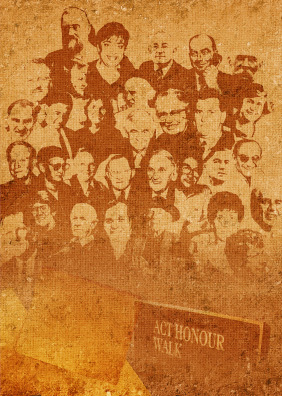 The ACT Honour Walk recognises individuals or groups from across all categories of endeavour that have made significant and sustained past contributions to the ACT. ACT Honour Walk recipients are then publicly acknowledged with a plaque in their honour on the ACT Honour Walk, located in Ainslie Place between London Circuit and the Canberra Times Fountain outside the Canberra Centre. What is the aim of the ACT Honour Walk? The award aims to recognise the immense contribution made by those who have helped to shape the city of Canberra as we know it today. This award also complements the Canberra Citizen of the Year Award that celebrates current and/or recent contributions to the Canberra community. Any person or group who has been a leading player in shaping the city of Canberra, or who has made a significant contribution to the Canberra community over a sustained period of time, is eligible for recognition on the ACT Honour Walk. Nominees do not have to be residents of the ACT and the honour may be awarded posthumously. Preference will be given to nominees who have not already been significantly memorialised in an existing ACT public memorial. How can a person or group be nominated for recognition on the ACT Honour Walk? Nominations can be submitted by anyone including individuals, businesses, organisations and community groups. The nominator should complete a nomination form detailing the nominee's personal details and provide a summary describing the extent of, or impact, of the nominee's past contribution that is specific to the ACT. Some of the areas previous recipients have been recognised for include (but are not limited to) community service, culture, sport, research, justice, education, military, arts and business. The nominator should also provide the details of a living next of kin of the nominee, if known, as well as details on two referees who may be contacted regarding this nomination. Unsuccessful nominations may be reconsidered in future years. The Chief Minister will make the final decision on the identity and number of recipients to be honoured each year. The next induction to the ACT Honour Walk will take place in 2020. Nominations are open year round. If you require further information please call the Protocol, Honours and Ceremonial Events Officer on 6205 3031.